R--- OH MY GOODNESS. Some of my faves are on here-- WHere the Sidewalk Ends, Little House on the Prairie, Boxcar Children, Green Eggs and Ham! AH! You and I were thinking along the same lines as far as classic children's lit goes. Read my list and then run right out and buy Green Eggs and Ham. It was one of the very few books we had at my house as a child. I didn't know Jumanji was a book, either. And as someone who DID read the Boxcar Books, they're worth it. Adults can probably read through one of them in 20 minutes. The first 14 or 15 were by the actual author and fit together chronologically, but all the rest are just set in the "modern day" and everyone stays the same age. Thanks for this list, its great! I sort of cheated and made two lists. I did one for picture books and one for ya. The picture books I just listed titles, but in YA I ended up describing types of books instead of specific titles, because there's so much I should have been reading but didn't. So glad you didn't miss these for your entire life! These are fantastic books. I put the wrong link in #17 and had to repost at #18. I am sorry. I too didn't know Jumanji was a book! I did read Alice as a child though and I did really enjoy it. None of these books are on my list, but some of these I wish I would have read as well! I did manage to read a few of these as a kid. I wish I wouldn't have missed Alice and Jumanji. I hope to read many of these titles very soon with my own children. Some of these I read as a child, others I have still not read. I found some parts of Alice's Adventures in Wonderland extremely confusing when I read them - but a a bowdlerised translation may have been to blame for that. I found it a bit twee when I read it as an adult. I read the Boxcar Children and it WAS fun to read as a child. I've read lots of these, but my favorite is definitely the Little House on the Prairie series. I read them over and over and over because they're so awesome! On the other hand, I never really liked Where the Wild Things Are. I think the illustrations of the monster guys were too scary for me. :p Great list, though -- now get to readin'! I couldn't think of enough that I wished I had read as kid, so in my post I also did books I wish I had skipped as a kid, LOL. Some of these I don't think were published yet when I was a kid...lol. "Where the Sidewalk Ends" was my favorite book as a kid. My third grade teacher would read one of the poems to us every day. The copy my parents gave to me when I was nine has been passed down to all four of my baby brothers, and now sits on my 7-yr old son's bookshelf. Alice in Wonderland made it onto my list as well. My husband loves the Just So Stories by Rudyard Kipling. I've only read one, but I'd like to read the others. Shel Silverstein was one of my favorites as a child! Now I want to go find my copy of this book. Great list idea! I attemped to do this on my blog, but I can't think of any books. I read a lot when I was younger, and I think the ONLY one I can think of that I wish I read, and I still haven't read it, (don't yell lol) is Catcher in the Rye. That was hard! Fun reading everyone else's lists, though. On Jumanji/not knowing it was a book: I don't have cable, so I wasn't prepared when I started reading aloud a Charlie and Lola book one day, and heard, "oh, they made a book from the cartoon!" Grr. On Shel Silverstein: my mother used to type up a poem a day and hide it in our lunchbox. The other kids always crowded around to see what she'd put in. The same thing happened with me and Where The Wild Things Are. I only ended up reading it because someone bought it for my daughter when she was born. You should read The Very Hungry Caterpillar. It was a favourite for me as a kid. 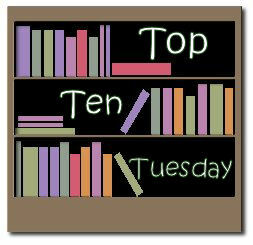 I didn't come up with a top 10, but I've recently read Anne of Green Gables, Little Women, and The Secret Garden for the first time and I know I would have loved all three if I had read them as a young(er) girl! Thanks for your list and for creating the list ideas: such fun! I forgot about the Boxcar Children books. I didn't discover them until I had a son (that happened with a LOT of children's books). The Little House books aren't on my list--but I think they should be! That is, I wish I had already read them . . . because I still haven't read them yet! LOL! And I hadn't known Jumanji (one of my favourite movies) was originally a novel. =S When I see the movie before reading the book, I usually wait until the visuals have faded a bit from my mind before getting to the book at last. That'll be hard to do with a movie I know as well as this one! Some of my childhood favorites on this list. Where the Sidewalk Ends, The Boxcar Children, Little House on the Prairie, Where the Wild Things Are. . . .i hope if you haven't read all of them now you will at some point. What fun! Wants me to start reading! This was a great topic! Great meme, and great question! Thanks for hosting. This is my first time joining in. The Little House books are some of my favorites--I read a set of them to pieces as a child, and the second set is rather battered. Wow! A childhood without Green Eggs & Ham??? Whoa! Very different indeed. Great memories reading your list. I loved The Boxcar Children. I always wanted to go out and live on my own when I was a kid. I've read half of the books on your list, which I think is pretty good. I'm not sure what books would be on my list, but I do recall some very fond memories about The Boxcar Children. I adored that series as a child. Great meme! It's interesting to note how many of the same books keep coming up. Also, how many of the books are fiction. Loved doing this! Totally agree with Green Eggs and Ham, the same thing happened to me,,and now it is one of my favourite books. Boxcar Children was another of my favorites! Luckily I had a cousin that owned most of them, so I got to read a lot! Great topic! The Very Hungry Caterpillar was one of my favorite books! I do need to read The Happy Prince and Other Stories because I love Oscar Wilde. The Very Hungry Caterpillar IS very cute. I recommend!! The Just So Stories? I like the title. I'm curious now. I love lists! And books...perfect combination.....I was trying ot think of the name of a series I read as a kid (The Polk Street School it tunred out to be:)) and I came across allthese great lists of books like "Top 10 Books if you Grew Up in....the 80s, 90s, etc etc.) Look forward to joining you next Tuesday! Thank you for this nice idea! I've only read half of these, but I think a great book in childhood can still be a comfort to an adult. Maybe I'll pick up a couple of these to add to my READ list.